Soft, thick, melt-in-your mouth sugar cookies with smooth & creamy frosting. 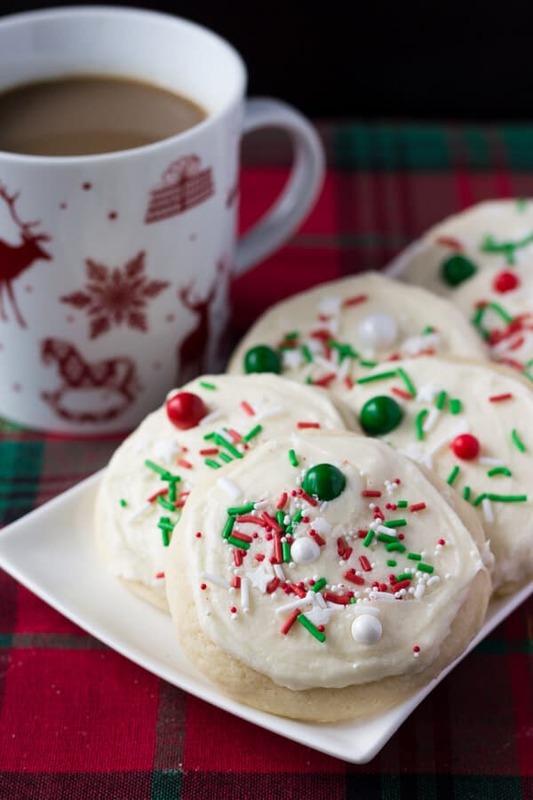 So delicious and no pesky decorating required, Santa loves these soft batch frosted sugar cookies! Too often after making sugar cookies I feel defeated. My Santas are neon pink, my angels look cross-eyed and there’s blobs of royal icing cemented to the kitchen table. But the most disappointing part is that I worked so hard on cookies that aren’t even that tasty. They’re too hard and the icing is just kind of gross.Don’t get me wrong – fancy sugar cookies with detailed royal icing have their place – and if I was an expert cookie decorator I’d make them all the time. But I’m not. And the chances of me becoming one before December 24th are slim to none. 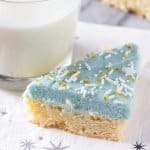 So today we’re making super soft, buttery sugar cookies with creamy frosting that’s deliciously fluffy and not too sweet. The type that you’re dying to eat and not just take a picture of. We’re making our own version of those Lofthouse frosted sugar cookies and I promise they’re even better than the original. Let’s chat here for a few minutes on what’s so delicious. First – the “secret” ingredient. In these cookies we’re using a little sour cream because it makes your cookies ridiculously soft and gives a richer more buttery sugar cookie taste. Then, instead of using all-purpose flour we’re using cake flour. 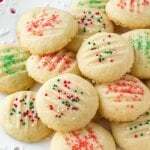 Cake flour is more delicate & fine – so using it along with a little cornstarch in your sugar cookies makes them even more delicate and melt-in-your mouth. Now, as a few notes for cutting out your cookies. This dough is very sticky – so it’s absolutely imperative that you chill the dough before rolling it out. You’ll need to flour the surface your working on, the cooking cutters & your rolling pan. Because these cookies are meant to be soft & thick, but still perfectly delicate in their cookie crumb – I wouldn’t recommend using detailed cookie cutters. Simple shapes like circles, hearts or candy canes work well. 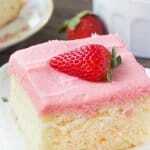 Then finally for the icing – a simple creamy frosting that you can swipe on with a flat-edge knife. I added just a little bit of cream cheese to my frosting because it adds extra creaminess and cuts the sweetness. 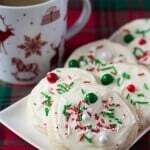 These soft batch frosted sugar cookies are my baking pride & joy this Christmas. So soft, melt-in-your mouth, with delicious creamy frosting – and no stressful cookie making. Yup – Santa will love them! Soft, thick, melt-in-your mouth sugar cookies with smooth & creamy frosting. So delicious and no pesky decorating required, these sour cream sugar cookies are extra soft and full of flavor. In a medium sized bowl whisk together 2 and 1/3 cups flour, cornstarch, baking soda & salt. Set aside. In a large bowl using a stand or hand-held electric mixer on medium speed, cream together the butter and sugar until light and fluffy. Add i the egg, almond extract, vanilla & sour cream and continue mixing until combined. Turn the mixer down to low and add in the flour mixture about 1/2 at a time, turning off the mixer and scraping down the sides of the bowl as necessary. The batter will be sticky. Add up to 3 more tablespoons of cake flour if necessary. Rip 2 pieces of cling wrap and divide the batter in half onto each piece. Wrap the dough in clingfilm and flatten into a round disc shape. Refrigerate for at least 4 hours or preferable overnight. When ready to bake, preheat the oven to 350F and line baking sheets with parchment paper or a silicone baking mat. Flour a countertop very well. Remove one disc of dough from the fridge and roll out to about 1/4 to 1/3 inch thick using a well floured rolling pan. Cut into shapes using a floured cookie cutter and place on the cookie sheet. Bake for about 8-10 minutes depending on cookie thickness. Remove from the oven and allow to cool for at least 5 minutes on the cookie tray before transferring to a wire rack to continue cooling. Continue with the rest of the batter, leaving the dough in the fridge until your ready to work with it. While the cookies are cooling, make the icing. In a large bowl using a stand or or hand-held electric mixer beat the butter and cream cheese until well mixed and no lumps remain. Add in the salt, almond extract and icing sugar about 1/2 to 1 cup at a time until you've added about 2 cups. Add in the milk or cream 1 tablespoon at a time, alternating with additions of icing sugar until you've reached your desired level of sweetness. 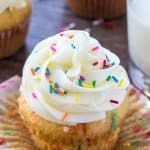 The frosting should be a little thinner than buttercream that you pipe on cupcakes. Frost each cookie and shower with sprinkles. Hands down the best sugar cookies I have ever eaten! These were delicious. Decorated them with hot tamale jellybeans and gingerbread man-shaped sprinkles which gave it a cinnamon kick in the toppings!